Nigeria’s pitch was that he could play an important role for the Super Eagles in Russia if he rejects Germany for Nigeria. 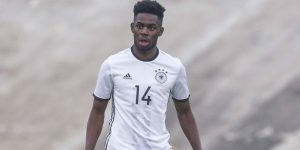 Gernot Rohr is searching for Nigerian talents in the Bundesliga with an attractive pitch to play at the world cup in Russia. However, it does not sound right to look for talents at this stage of the preparation for the world cup. Jordan Torunarigha, born in Chemnitz has decided to dump Nigeria for personal reasons. Gernot Rohr should seek players who are ready and able to play for the Super Eagles without a fuss.